When we left off last time, the players and owners finally had signed a collective bargaining agreement (CBA 4) in July of 1976 codifying, for the first time, terms for free agency. Four months later, there were actual free agents, and the owners reacted by handing out record contracts nearly every day. The first “re-entry draft” was held on Nov. 4, 1976, and unlike the prolonged negotiations of 21st-century offseasons, the players acted as if they feared waking up from their dream. Within a couple of weeks, almost all of the 24 free agents were signed. The first player signed under the free agent terms of the CBA was relief pitcher Bill Campbell, given a four-year $1 million deal by the Red Sox, making him (very briefly) one of the highest-paid players in the game. 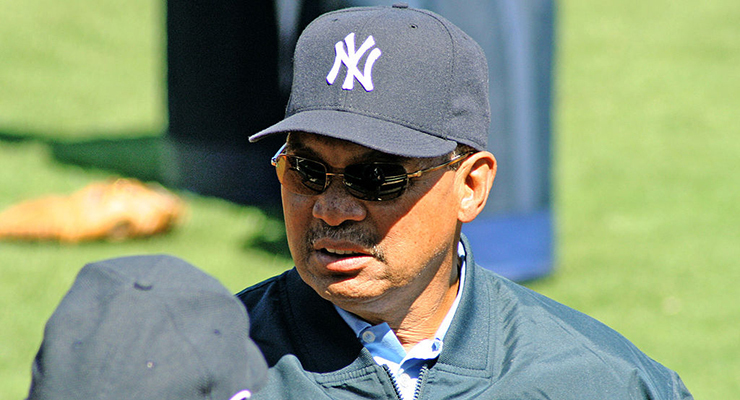 This deal was bested daily throughout November, culminating with the Yankees giving Reggie Jackson $3 million over five years. More disturbingly for the owners, the ripple effects to non-free agents were swift: In March of 1977, the Phillies signed their own player, Mike Schmidt, to a six-year contract extension at $560,000 per year in order to keep him from testing free agency that fall. More such deals followed. For the players, the salary boom offered proof the owners had been underpaying them all along. Inevitably, the owners complained they could not afford to pay these salaries they were freely agreeing to pay. Led by Commissioner Bowie Kuhn, the baseball magnates began to press the case that the game was headed for Armageddon, a case they would press for another 25 years through several more CBAs. The players, led by Marvin Miller, responded by asking for proof the owners were losing money. “Trust us,” was the owners’ response for many years. When it came to negotiating the next CBA, due to expire in December of 1979, the owners claimed to be most concerned with maintaining competitive balance, to keep rich teams from signing all the best players. Their solution was to impose “compensation”–one or more players going from the signing team to the team that lost the free agent. (The prevailing CBA 4 specified a draft pick as compensation.) This is how free agency worked in the NBA at the time–the commissioner chose a player or two to essentially complete a “trade.” The baseball owners argued this was still “free agency,” while the players countered that the market would grind to a halt if signing teams were going to lose players of quality. The owners’ first formal proposal also eliminated arbitration, instead specifying defined salaries over a player’s first six seasons. The players countered by asking for free agency after four years. This was a fairly large gulf. The first few months of 1980 involved heated negotiations with little movement. In March, the players overwhelming agreed to set a strike date, eventually settling on May 22. After an all-night negotiation session on deadline day, the two sides came to one of the more unsatisfying agreements in their long history. At the last minute, with no agreement forthcoming on the most contentious issue, free agent compensation, Miller proposed that a joint study committee be created to hash out that single issue and make a deal on everything else. This allowed a new CBA to be consummated but really made no progress on the key sticking point. The committee consisted of two players (Bob Boone and Sal Bando) and two general managers (Harry Dalton and Frank Cashen) and accomplished exactly nothing. The owners used this committee to be able to say “we tried.” As the futility of the Joint Study Committee became fully apparent, the players again set a strike date, this time picking May 29, 1981. The players also argued successfully before the National Labor Relations Board that the owners had not been negotiating in good faith, and the NLRB sought an injunction against the owners. The players agreed to delay going out on strike while awaiting the court’s ruling on the injunction. The judge decided for the owners; moreover, he ruled the players must strike in the next 24 to 48 hours or forfeit the right. In response the players went out on June 12 and stayed out for seven weeks. Changes to compensation system: Using a crude statistical formula, three tiers of free agents were created: Type A (those who ranked in top 20% at their position), Type B (20% to 30%), and unranked. Type A compensation: Draft pick from signing team as in previous CBA, plus a pick from a general player compensation pool (like an expansion draft). For the compensation pool each team can protect 26 players; teams can only lose one player in any one year; teams losing a player from the compensation pool receive $150,000; and five teams can opt out of signing Type-A free agents and not be subject to the compensation pool. The new agreement amended the prevailing CBA 5 to add a form of free agent compensation. Rather than getting a major league player from the team that signed the free agent, a team would instead select a player from a pool made available by all the teams. The compensation applied only to the highest-quality free agents, though losing lesser free agents could still net multiple draft picks. That first offseason, only one free agent loss qualified for player compensation: White Sox pitcher Ed Farmer, signed by the Phillies. In return, Chicago selected catcher Joel Skinner from the Pirates. Not surprisingly, this system satisfied neither the teams nor the players and was mocked by the fans and the media. More gallingly for the owners, this compensation system had been proposed by Miller back in June–before the strike had begun. The owners rejected it out of hand, only to accept it two months later. “This is what we struck 50 days for?’ said Texas owner Eddie Chiles. “I can still lose a player off my roster without getting one myself?” Most owners were angry, feeling they had once again been hoodwinked by Miller. Miller retired as MLPBA executive director in December of 1982. His first replacement was Ken Moffett, the federal mediator who had worked with both sides during the recent negotiations, but after less than a year he was forced out and eventually replaced by Don Fehr, who led the MLBPA for the next 24 years. Fehr had been lead counsel for the union since 1977. Not only had Miller gained free agency for the players, he had created an environment in which the players received basic minimums and allowances. As charted in Part 1, the players earned a minimum salary that increased much faster than inflation and a road meal money allowance that at least kept pace. Similarly, the players received a bump in their spring training allowance—originally dubbed Murphy Money in honor of Robert Murphy, who tried unsuccessfully to organize the players in 1946 but salvaged only a spring training per diem—with the first CBA and increases thereafter. 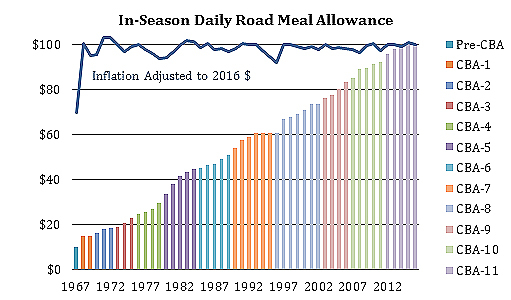 The weekly allowance remained remarkably close to $300 in 2016 dollars over the five decades of CBAs. Baseball was hit hard by cocaine use in the 1980s, disrupting the careers and lives of many of its most prominent players. The history of this issue is complicated enough to warrant an article in its own right, but it was never part of a collective bargaining agreement. We will therefore set it aside, other than noting that it helped pollute an already-divisive atmosphere between the two parties. The CBA expired in December of 1984, but once again negotiations did not really heat up until the next year. In early March of 1985, Lee MacPhail, who had taken over as management’s chief negotiator, claimed the clubs were struggling financially. Under collective bargaining rules, this statement required owners to make financial data available to the union. In early April, after many years of holding back, teams finally handed over documentation to support their claims. This tactic backfired. The players hired Roger Noll, a Stanford economics professor, to review the materials. Noll concluded the losses were mostly bookkeeping artifices (charging sister companies below market rates for television, concessions, parking, etc.) and that the clubs’ claim of a $66 million loss was actually a $24 million profit. “It takes either extravagant management or a poor team in a weak market to lose money,” concluded Noll. Nonetheless, the owners again demanded significant givebacks, including several new rules that would essentially prohibit teams with above-average payrolls from signing free agents–a salary cap without the name. The owners also wanted significant restrictions on salary arbitration awards. Once again, the players wanted things to stay pretty much as they were. They set a strike date of Aug. 6 and eventually went on strike for two days. The minimum salary was increased to $60,000, with cost of living increases for duration of CBA. The compensation system for teams signing and losing free agents was modified: The compensation pool system, the only thing the owners got out of the 1981 strike, was scrapped; the re-entry draft, a key provision in the 1976 CBA, was eliminated; free agents were now free to sign with any team; and a team now needed to offer free agents one-year salary arbitration to receive compensation. The service time required for salary arbitration was raised from two years to three years. The big news here was the last item, the players’ loss of a full year of arbitration. This was the first time the players had ever gone backwards on any major part of the CBA. Lee MacPhail, who concurrently negotiated a new pension agreement with the players, was given a lot of credit by the owners, who seemed relatively pleased with both deals despite not getting any relief on their demands to restructure free agency. Miller, who came out of retirement to participate on Fehr’s negotiating team, was not happy with the giveback and grew more disenchanted as time went by and other events played out. But for now, a kind of peace seemed to be at hand, perhaps at its highest level since the Messersmith decision nearly a decade earlier. Nevertheless, the years covered by CBA 6 were a very bad time for player-management relations. The CBA itself worked just fine, but the owners took a series of steps that destroyed whatever good will the two sides might have briefly gained. A year after he became commissioner in 1984, Peter Ueberroth orchestrated a policy of owner collusion to artificially depress salaries, discontinue contracts longer than one year, and prevent free agents from changing teams. In 1985, a record 62 players filed for free agency, but only four, all marginal players unwanted by their former teams, signed with new clubs. This brazen conduct, all supposedly the result of independent decision-making on the part of the 26 teams, went on for more than three years. In addition, the owners began using 24-man rosters (which were permitted but rarely used other than for brief periods) to save on the salary of the 25th man. And they began a widespread practice of leaving prized rookies in the minor leagues in April order to delay their service-time clock from beginning. Red Sox outfielder Ellis Burks, for example, spent the first few weeks of 1987 in Triple-A to save the Red Sox a few dollars down the road. Ultimately, the owners lost three major grievances–one for each of the 1985 to ’87 free agent classes–and paid the union $280 million in damages. More ominously, the widespread collusion cemented in the players’ minds a deep and lasting mistrust of the owners. In surrendering a year of arbitration, the union had conceded a significant item in the last negotiations, and they were repaid with a near total loss of the free market they had been granted in 1975. The relationship between the two sides had been difficult for many years, but it grew toxic after the collusion of the 1980s. Heading into the next negotiation in the winter of 1989-90, the angry players vowed to get the year of arbitration back. The owners, far from chastened, instead wanted to create a salary pool of 48 percent of defined revenue (gate receipts and TV/radio income), with a salary cap and floor for each team. They also wanted to scrap arbitration completely and replace it with a pay-for-performance scheme. The union was appalled, and players prepared for the worst. The owners decided not to open spring training camps rather than allow the players to force a mid-summer strike. Fay Vincent, who had been commissioner only since the previous September, basically forced the owners to give up their salary cap proposal and negotiate, but the lockout continued for several weeks. Salary arbitration eligibility stays at three years, but the top 17 percent of two-year players by service time are also now eligible. Known as “Super-2s”, this represents about 15 players per year. Clubs are permitted 24-man rosters for 1990 but 25 starting in 1991. Teams will receive draft choice compensation for losing a player only if the club offers arbitration. Ultimately, there was very little new in this CBA. The players got some of their arbitration losses back, gaining eligibility for 17 percent of the players with between two and three years’ service time. They also renegotiated the guaranteed roster size, effectively restoring 26 big league jobs. The owners had wanted to impose a dramatic new order without any success. The owners blamed Vincent for forcing them to cave. His standing never really recovered, and in 1992 a cabal led by hard-liners Bud Selig and Jerry Reinsdorf forced his resignation. The owners named Selig “acting commissioner,” a post he held for nearly six years. With the expiration of CBA 7 at the end of 1993, the owners, particularly those in the smaller markets, were itching for a decisive showdown with the players. Despite record-setting attendance that season (even excluding the two expansion teams), the small-market teams had been pushing for a change in the status quo, including revenue sharing among the franchises. The owners believed gaining a salary cap from the players would make revenue sharing more palatable to the large-market clubs. Selig, who was still the owner of the Milwaukee Brewers, was at the forefront of a confrontational strategy: If the players would not agree to a salary cap, the owners should be prepared to lock them out and use replacement players. To serve this strategy, Selig pushed to amend the rules so that 75 percent of the owners were required to ratify any contract agreement, furnishing additional clout to the small-market owners. In July, the owners unilaterally suspended distributions to the players’ pension fund and did not deposit the scheduled $7.8 million for the player’s share of the All-Star Game proceeds. Considering that the pension was the driving force behind the creation of the MLBPA and one of the players’ most sensitive issues, such tactics only helped solidify the union. The years between 1977 and 1994 were characterized by a perpetually deteriorating relationship between the two sides. The owners had been battered by the Messersmith decision and the dawn of free agency and had been unable to win back much of what they saw as a series of losses in the CBA battles. They still believed the system was terrible, and they remained determined to create a more beneficial system. They had failed in 1980-81, made a small gain in 1985, and failed again in 1990. But with the players on the verge of striking yet again, the owners were more determined than ever defeat the union once and for all. People keep praising Selig for all the good he’s done for the game over his long stint as MLB Commissioner, but they keep overlooking his bad decisions. It’s stunts like this and how he turned a blind eye to performance enhancing drugs until finally being pressured into doing something about it that show the other side of his highly mixed record and that he doesn’t really deserve to be a Hall of Famer. An oddity associated with CBA-5 is that the free agent compensation rule wasn’t always followed. For example, you note that the White Sox got a player from the pool when they lost Ed Farmer. However, they did not get an additional draft pick in the June 1982 draft as the agreement called for. Any idea why? Cliff, I do not have any idea why, no. I wonder if teams had the right to not make the picks. As recently as the 2000s there were teams who did not want picks because they did not want to spend the money for the additional players. Not sure if that’s why. The Flyknit upper comes in a Dark Green hue, while Black takes care of the VaporMax bubble sole, the Nike Swoosh, as well as seen sporadically all around the woven upper.